Editor's note: With Russell M. Nelson becoming the new president of the Church, it seems appropriate to repost the first installment of "Mormon Book Bits" by Dennis Horne. It should be realized that this book was written before Russell Nelson became Elder (now President) Russel M. Nelson of the Quorum of the Twelve Apostles (1979), and therefore contains no information about his service as a member of the Quorum of the Twelve. Without his call to this position in the Church, the book would likely have remained a wonderful but obscure personal biography of a prominent heart surgeon and mid-level church leader, but would not have attained the status and desirability it now carries, especially for collectors of LDS biography. The lack of apostolic status at the time of publication seems to have been both a positive and a negative. Positive because the book did not have to be censored and therefore contains marvelous information only meant for family and friends. Negative because his unquestionably many edifying apostolic experiences are absent. 1) A detailed account of a visit from the Spirit World of his great-grandfather to his grandfather (16-18). Elder Nelson has referred to this sacred story in general conference talks. 2) His pioneer work in the medical field of heart surgery. 3) A section (Part B) covering his experiences with many prominent Church leaders—among them David O. McKay, Joseph Fielding Smith, Harold B. Lee, and especially Spencer W. Kimball. 4) The most detailed account existing of the heart surgery performed by Dr. Nelson on President Kimball when it was revealed to Nelson that Kimball would someday become the President of the Church (162-65). 5) His service as the General President of the Sunday School. 6) A priesthood administration given to President Kimball by Dr. Nelson by means of which the Prophet sustained a quick miraculous recovery. 7) Mention of a dream had by President Hugh B. Brown in which he was visited and conversed with Harold B. Lee (who had died a year earlier), the night before the dedication of the Washington DC Temple (188). 8) The miraculous blessing and healing of a dying person (294-95), as well as mention of other miraculous priesthood administrations. 9) Other information that I personally will not mention, that only those who take the time to read it might find and be edified and uplifted by. Before publication, Elder Nelson wrote that he: “Met for one hour with President Spencer W. Kimball reviewing the contents of this book. He studied it carefully and approved my publishing the chapters referring to my privilege of being his servant and surgeon. He was so happy to see his request honored that the book be written” (389). 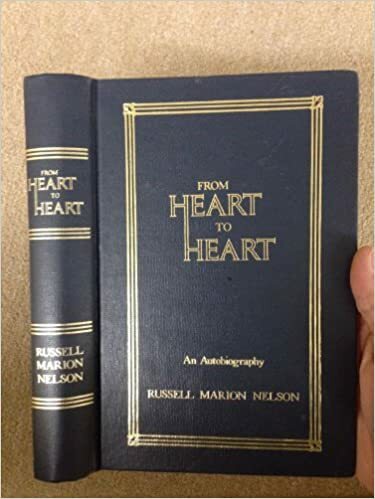 President Kimball also wrote the foreword, in which he said: “This book, the engaging record of the life and experiences of Russell Marion Nelson, is a fulfillment of a great dream…. This work will bring joy and peace and happiness to its readers.” Also, “It pleases me very much to note that he has done a superb work in assembling the information to bring this book into existence. Seldom are so many pages put together to create a life history so rich and full of experiences as this record…. It seems to me that it has been done beautifully and without flaw.” There is no question that the writing style and tone of the book promote faith. In the Preface Elder Nelson referred to the frightening experience that jolted him into writing the book: “The final nudge came as I was a passenger in a small airplane plummeting earthward with one of its two engines exploded. I realized then that although both the spiritual and material needs for my family had been provided, I had not left for them a reasonable recapitulation of my life that they could review. The safe emergency landing of that disabled aircraft provided me with the chance I needed.” On January 28, 2009, mention of the scarcity and collectibility of this book was made by a Deseret News columnist, raving about its legendary mystique among book lovers.